C5 Corvette Pro-Touring Brake System. Designed for Z06 wheel fitment for Corvettes on Road Course, AutoCross, Time Attack, and Speed Stop competition. Optimized for stopping power with the stock master cylinder. Six Piston front calipers with 14" x 1.25" rotors and Four Piston rear calipers with 13.6" x 1.25" rear rotors. Full floating system. C5 Corvette Pro-Touring Brake System. Designed for Z06 wheel fitment for Corvettes on Road Course, AutoCross, Time Attack, and Speed Stop competition. Optimized for stopping power with the stock master cylinder. Six Piston front calipers with 14" x 1.25" rotors and Four Piston rear calipers with 13.5" x 1.25" rear rotors. Full floating system. 4 piston rear forged aluminum calipers perfectly calibrated for the correct front/rear bias. What features should you expect? 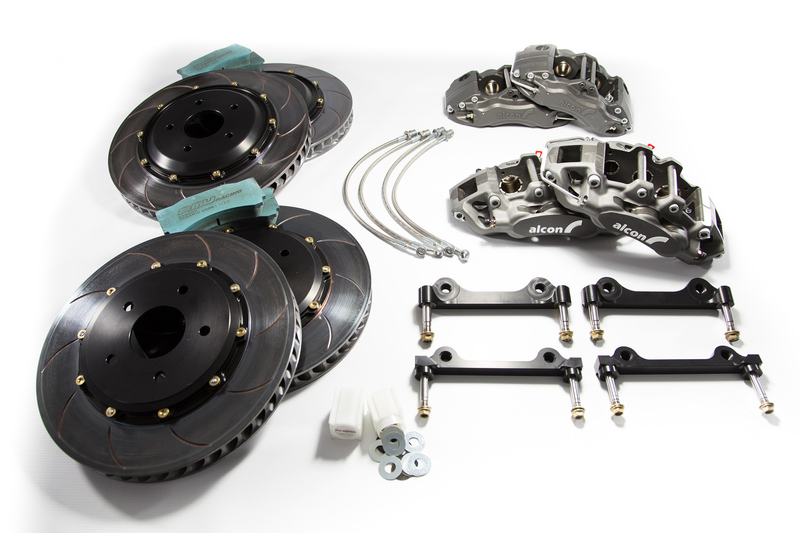 The kit includes ALL components needed including floating rotors with spring dampeners, calipers, high temp brake pads, all hardware and stainless steeel lines. Parking brake only to be used while stopped. Drifting/Rally use of rear brake for rotation is NOT recommended.